USB portable devices are very common in use nowadays. They are used to store data.When you have your data stored in your USB device and you want to play all of your storage data on your mobile phone or and portable device , the USB On the Go function gives you possibility. It is a common feature in the mobile phones and tablet specially those which are made in China. Even a cheaper mobile or tablet from a chines manufacturer provides the facility of UBS On the Go. We have seen this facility in the "Ainol" tablets and "DANY" tablets. These are Android based tablets. The news are coming that next windows mobile version will also support this feature. It goes without saying that if these news are correct , then it will be a revolutionary step of Windows Phone to compete Android.A Former Microsoft employee Nawzil Najeeb has broke the news that his device that runs on Windows Phone 8.1 is able to recognize a USB connected to the gadget. “USB storage detected. 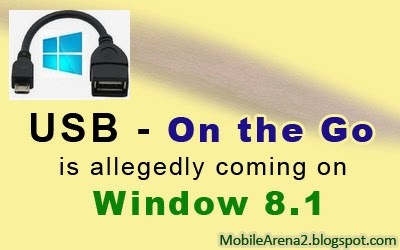 Tap to view files,” is the message is open in a new window on the screen of his device when he plugged in a USB thumb drive to his Windows Phone using a USB OTG (on-the-go) cable. This is very interesting and fine news for the lovers of this features that are looking forward to be able to access the file system in Windows Phone. We should point out that this does not mean people will see this feature in the final version of Windows Phone 8.1, but it is a source of excitement that this feature is coming soom and Microsoft is aiming for as unified an experience as possible across Windows devices. It only makes sense that the user would gain access to some type of file management on Windows Phone. As we find it on the Personal computers , the same pattern will adopt in WP8.1 to show the your USB data. By this feature USB OTG support on WP8.1 will open a lot of functionality to Windows Phone. In addition to external storage devices, you could see all sorts of accessory support. The more news about this topic and leaks of information are continue to coming, we are curious to see what is the fact and what ultimately gets announced by Microsoft.